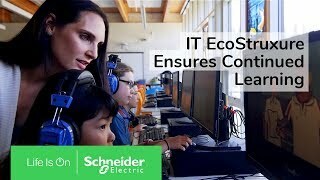 EcoStruxure IT Expert provides an efficient way for distributed IT and local edge organizations to monitor their power and cooling multi-vendor physical infrastructure equipment. Real-time monitoring, benchmarking, assessment, and instant fault notification and escalation provide the visibility and insights you need to proactively manage your IT infrastructure. This open and flexible central repository of critical information can be accessed by multiple users, and your preferred partner, from anywhere on the network, allowing quick resolution of critical infrastructure events that can adversely affect IT system availability. With the power of the cloud, you can make data-driven decisions, react to abnormal device behavior before it becomes an issue, and run analytics that will help you focus on what matters. Automatic updates and backups Updates and backups are automatically applied to always provide the most current solution. Alarm Consolidation Reduces erroneous alarms and decreases MTTR by detecting the root cause in minutes. Benchmarking Compare your devices performance against the total population of similar devices in the industry. Assessment Determine patterns of healthy behavior and provide a scorecard using analytics and machine learning to identify which devices require attention. Cloud-based monitoring Maintain uptime for local edge and distributed environments and check the status of your physical infrastructure equipment from a centralized view, ensuring peace of mind whether onsite or remote. Centralized Inventory Management Obtain Immediate and detailed visibility of all physical infrastructure devices by geography or customizable location. Multi-vendor device support Extensive multi-vendor support for monitoring networked SNMP, MODBUS and Redfish devices. Enables visibility of devices through threshold alert notifications, data trending and reporting. Event Notifications Receive real-time event notifications that minimize response times to critical physical infrastructure situations, reduce mean time to repair, improve efficiency, and maximize uptime. Encrypted communications 2048 bit RSA certificate and data is encrypted in transit using 256 bit AES encryption. EcoStruxure IT Gateway uses an outbound connection through Port 443, and only communicates to EcoStruxure IT cloud using 40.84.62.190 and 23.99.90.28.